Inmarsat (LSE:ISAT.L), the leading provider of global mobile satellite communications services and Intellian, a global leader in satellite communication antenna systems, have announced a significant deal with EUKOR Car Carriers. The deal will enable EUKOR, one of the world's largest shipping companies specialising in the transportation of cars and other rolling cargo, to take advantage of the latest technology offered by Intellian and Inmarsat's new high-speed broadband Global Xpress (GX) network. EUKOR has selected Intellian's latest GX100 terminals to equip its 27 vessels with regional connectivity powered by GX in the Indian Ocean Region. Once all three GX satellites are live and operational EUKOR will be able to harness the Fleet Xpress service on a global basis. A spokesperson for EUKOR commented on the significance of the new contract saying, "Operational efficiency, vessel safety and environmental performance is at the heart of EUKOR's business operations. The eventual installation of Fleet Xpress on 27 of our vessels represents another step in optimising our fleet across these areas. The decision to prepare our vessels now, not only means that our fleet will have immediate access to Fleet Xpress as soon as it becomes available but that our vessels are already able to access Global Xpress capability when operating in certain geographical areas. With a worldwide network connecting over 220 ports, truly global connectivity is essential for positioning us to best meet our customers' needs now and in the years to come." "We are delighted that EUKOR has made the decision to invest in our latest high-throughput, high-speed Global Xpress service. The third satellite in the Global Xpress constellation required to deliver worldwide coverage, was successfully launched at the end of August and we will see full global coverage in the coming months." said Ronald Spithout, President Inmarsat Maritime. "For ship operators, the days of trying to work around a patchwork of different VSAT networks with fluctuating service availability and quality are over. Fleet Xpress, the maritime variant of Global Xpress, redefines what's possible for maritime communications through the availability of higher bandwidth on a consistent, end-to-end global basis," he continued. "The commercial maritime sector has been excited about this type of connectivity for some time because it has the potential to transform shipboard life and we see the EUKOR deal as a major step forward in its expected adoption across the maritime fleet." 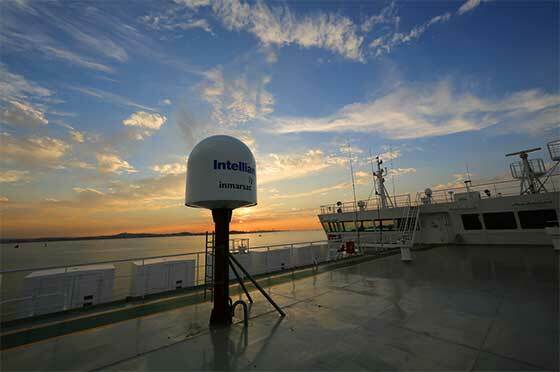 "We are delighted to be involved with EUKOR's decision to introduce latest generation satellite communications to vessels in its fleet and as one of only three approved terminal suppliers for Inmarsat's Global Xpress network, it is a great privilege to have been selected to partner on this commercial maritime contract," declared Eric Sung, Intellian President and CEO. "The move demonstrates the importance of state-of-the-art communications to progressive shipping companies. Broadband connectivity is no longer merely a ‘nice-to-have': it is essential for efficient shipboard management and crew welfare and we see this contract as one of many." Fleet Xpress is an integrated Ka-band / L-band service that will deliver the world's first globally available high-speed broadband service from a single network operator. The high-performance, high-throughput network will open up unlimited possibilities for maritime applications, real-time monitoring and data analysis that will enable smarter and more efficient shipping. Until GX enters global commercial service, the EUKOR vessels will be able to access Ka-band services within the coverage area of the first Inmarsat-5 GX satellite which covers the Indian Ocean Region. Outside of this area, switchover to L-band service, utilising Inmarsat's existing Inmarsat-4 (L-band) network, will occur. Intellian GX terminals are specially designed for easy delivery, installation and deployment. The systems comprise one antenna above deck and a single Below Deck Terminal (BDT), a unique component engineered only by Intellian to complement the new GX terminals. Intellian's exclusive BDT features a built-in GX modem for simplified installation and reduced overall space requirements. The unit is Wi-Fi enabled, has a built-in 8 Port Ethernet Switch and integrated AC power supply, as well as a front panel touch display with easy navigation buttons. Systems are delivered to ships, safely and securely crated with fast-release hinge pins revealing pre-slung lifting straps on the radome. The terminals are designed with web, mobile and PC applications and come with an intuitive graphical interface for easy set-up. Shipboard installations can be remotely monitored using Intellian's Aptus Remote Control Software.